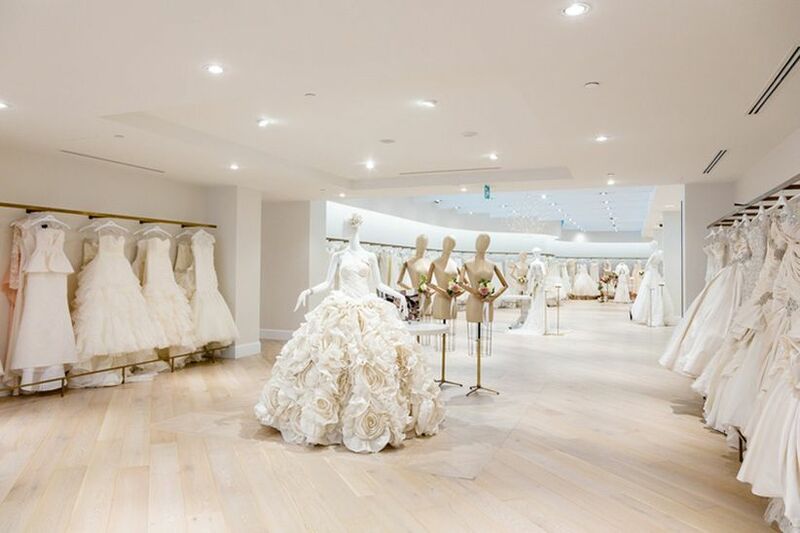 7 Wedding Dress Shopping Don’ts | Wedding Ideas ARE YOU A VENDOR? Wedding dress shopping can be tough. Avoid these missteps and finding your fairytale frock will be a little bit easier. Wedding dress shopping is definitely one of the best parts of the wedding planning process. 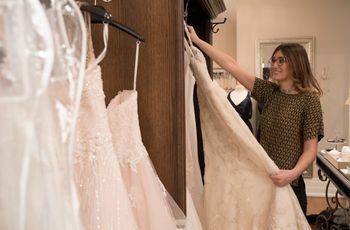 You get to try on dozens of dreamy gowns that’ll make you feel like a real life Disney princess (and who doesn’t love that!). 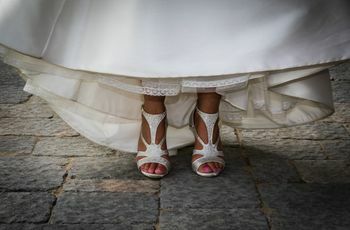 However, there are a few pitfalls that many a bride has faced, and we don’t want you following in their footsteps. Avoid these major no-nos and wedding dress shopping will be a stress-free blast. Here are a few wedding dress shopping don’ts. 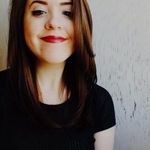 It’s tough not to get swayed by bridal fads, especially if you’ve spent months scrolling through popular pages on Pinterest and Insta. Just remember when you’re wedding dress shopping, trends come and go and they don’t necessarily suit everyone. If you don’t feel your best in a flowy boho number, consider going for something classic. Or, if the Kim Kardashian style just doesn’t suit you, nix it and follow your own rules. I promise, the fashion police will not arrest you on your big day. You’re probably tempted to bring all your besties along for your bridal boutique bonanza (after all, shopping with friends is a blast). But, wait! Before you send out a group text inviting everyone from your college roommate to your cousin, think about who you really want there. Does one of your pals constantly critique your style? It may be best for her to sit this one out. 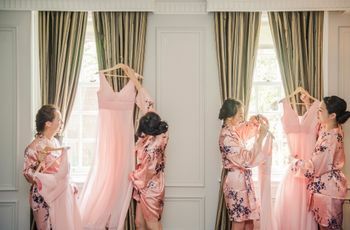 Try to keep it to four or five of your closest friends and don’t forget to put your mom (and soon-to-be mother-in-law) on your wedding dress shopping guest list. You probably have a few opinionated ladies (and/or gents) in your squad. While listening to their opinions is fine, you don’t want to let them make the decision for you. You’ll be the one sporting this gown on your big day and you want to feel confident, comfortable and beautiful. If that means picking a dress that they’re not head-over-heels for, so be it. You probably haven’t picked out your bridal undies just yet, and that is A-OK. However, you’ll want to bring the right undergarments to your try-on sesh. If you plan on sampling strapless dresses, you’ll need a strapless bra. In the market for a skin-tight silhouette? Make sure you wear undies that won’t show through the gown. Remember, you can always bring a few extra options in your bag! This rule applies to just about every major life purchase and should not be ignored when wedding dress shopping. Don’t go into a shop and try on a $11,000 dress when you can only squeeze a $2,000 frock into your budget. You’ll most likely end up comparing every gown to the more expensive one, which can really rain on your parade. Accessories make a huge difference, so put them to use when you’re trying on gowns. 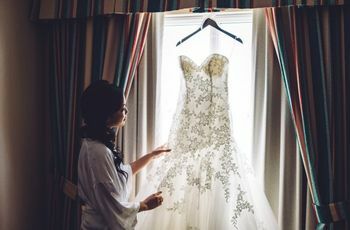 Salons typically carry an array of veils, sashes and other goodies that’ll transform the look of a dress, so don’t be afraid to ask your consultant for options. Who knows? A glitzy belt could turn a dress into “the dress”. You aren’t limited to just one gown! Absolutely love a dress with a mile long train? You can swap it out for a shorter style post-ceremony (you know, something that’ll actually allow you to enjoy dancing). Word to the wise, if you go this route, you’ll want to hash out budgets for each frock before you set foot in any shops - you don’t want to break the bank for an outfit change.